You don’t have to spend much time on social media to see how popular online videos and animations have become. Animation, in particular, is proving to be a perfect online option for communicating data-driven content to a large audience. So why are these short and simple animations the preference for this type of messaging? The main benefits are their functionality and memorability. Today a majority of audiences are viewing social media content on their mobile and obviously detailed infographics do not work well at this size. Not only do animations break down this material into bite-size and viewable pieces of information but a story can be built around it, transforming data into a digestible piece of eye-catching entertainment for people to watch and share. Animated content is also hugely beneficial for clients wanting to present internal information such as annual reviews and brand stories. As an alternative to the traditional route of Powerpoint and PDFs, animations are an engaging option that can be created in a short amount of time and succeed in communicating key messages in a more focussed, dynamic, and memorable way. Obviously static infographics still have their place and, fortunately, the way these animations are often built means that any supporting material can be created easily from the same collection of graphics. 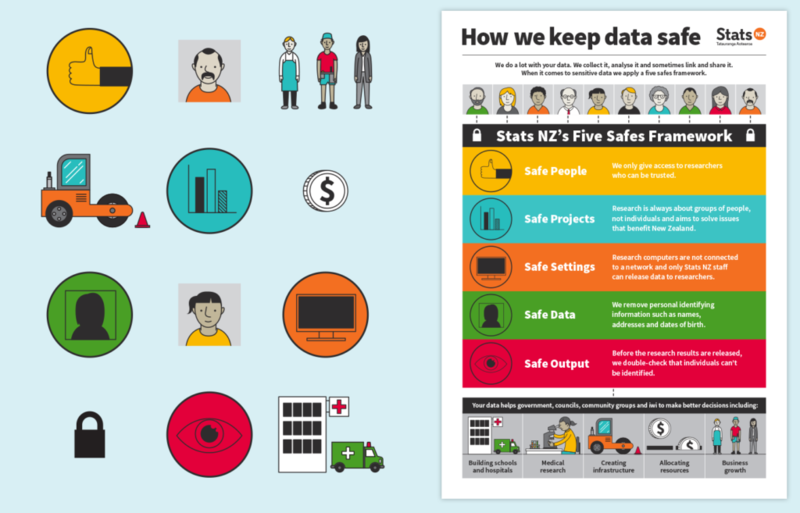 As a recent example, Statistics NZ asked us to create an animation for the NZ public about keeping data safe. Along with the animation they required a print and web infographic and a collection of gifs. We were able to create this collateral from the elements used in the animation enabling us to quickly deliver a cohesive collection of branded content in an economical way. Gusto’s in-house animation capability has been invaluable for our clients as it means that the very designers who understand their brand and how to represent their data in an engaging way can apply that knowledge and skill to this popular cost-effective format.